This year, the prestigious Reading Guild of Artists' Marie Dyson Award has been awarded to two artists. The names were released at the award ceremony on Friday 1 March at Reading Museum. The joint winners are Calina Lefter, for her multi-media piece entitled Breakfast and Chris Mercier, for his drawing entitled Victor Rows Out. 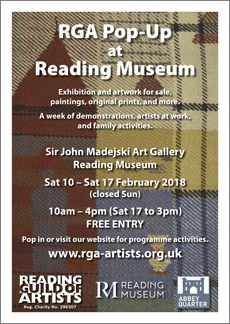 Reading Guild of Artists’ (RGA) 89th Annual Exhibition kicks off at the Sir John Madejski Art Gallery, Reading Museum, from Wednesday 27 February to Saturday 9 March, 10am to 4pm, except for Friday 1 March when it is closed to the public between 12noon and 2.30pm. At the Show, visitors will be able to purchase works of art by RGA members and works are in a wide variety of styles and media. 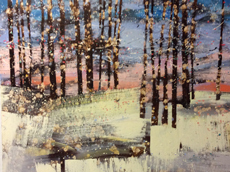 The RGA Annual Exhibition is an opportunity to celebrate the Guild and its artists – culminating in the presentation of the prestigious Marie Dyson Award – which goes to an artist whose work is judged to be of outstanding merit by an invited and independent assessor. 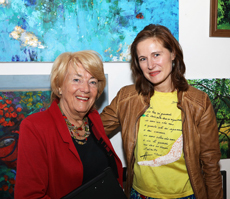 Diana Seidl, judge of this year’s Marie Dyson award and renowned artist and author, said: “I am delighted to judge the Marie Dyson award this year." “It is just over 50 years that this prize was first inaugurated. 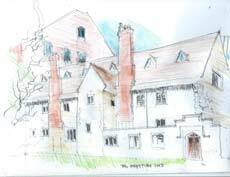 Being Head of the Arts Faculty at Pangbourne College for 25 years gave me experience of lots of different styles of artistic expression. Also, working as an examiner for A level art at the Cambridge Board, broadened further my experience of creative arts." 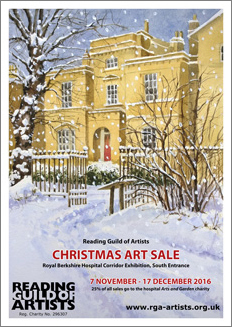 Come along to the Reading Guild of Artists’ art sale – and enjoy half term activities too! 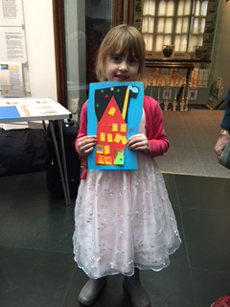 There is still time to have half term fun, courtesy of Reading Guild of Artists (RGA) who have taken over the Sir John Madejski Gallery, Reading Museum for half term. As well as hosting many fun, family-friendly activities during the week, members of the RGA are exhibiting small art works – available for purchase. 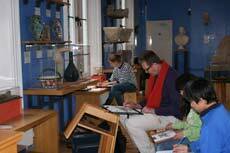 The fun and lively workshops for children and adults, run from Monday 18 February to Saturday 23 February. Workshops take place Monday to Friday during the week, between 10.30am and 3.30pm and between 10.30am and 12noon on Saturday 23 February. 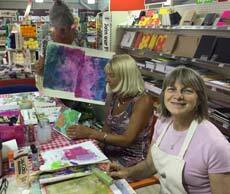 The workshops are drop-in sessions and all free of charge. No pre-booking is needed. 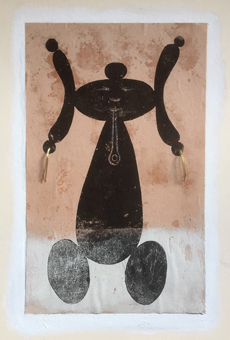 Throughout half term, Reading Guild of Artists (RGA) will ‘take over’ Reading Museum – exhibiting small works by its members and host a series of fun and lively workshops for children and adults, from Monday 18 February to Saturday 23 February. Workshops take place Monday to Friday during the week, between 10.30am and 3.30pm and between 10.30am and 12noon on Saturday 23 February. 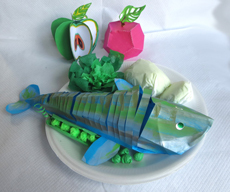 The workshops – which are drop in sessions and free of charge – are designed to encourage children and adults to think creatively in three dimensions, within the context of food and the Medieval period. By the end of the week, the plan is to have a constructed banquet laid out on a long table. 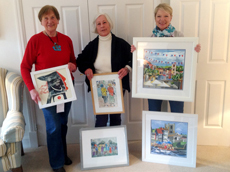 Time’s running out to visit Reading Guild of Artists’ charity art sale. 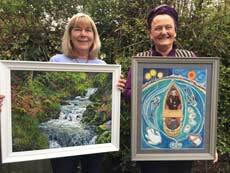 Reading Guild of Artists (RGA) annual charity art exhibition, which started in early November, is now approaching its final week, ending Saturday 15 December. 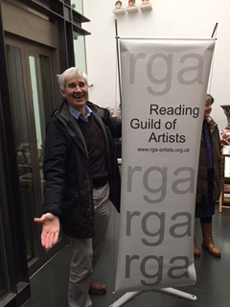 Reading Guild of Artists’ (RGA) charity art sale is still in full swing, and runs until Saturday 15 December. 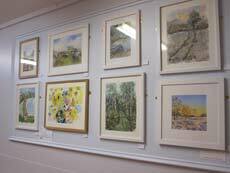 The charity art sale is in Royal Berkshire Hospital, Reading. Entrance is free and 25% of the proceeds go to the Hospital’s ‘RBH Voluntary Services’ charity. 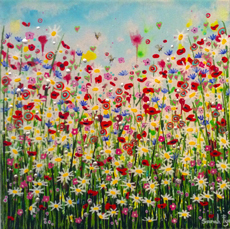 The works of art for sale feature a wide-range of styles and use many different media. 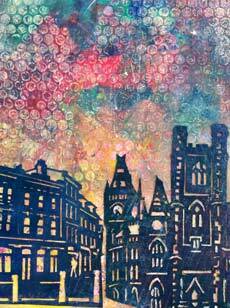 One RGA member, Trish Roberts, was inspired by the centenary of the First World War, for her piece Perhaps. 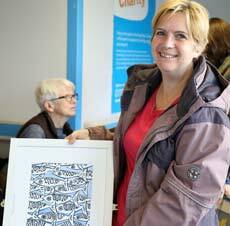 Reading Guild of Artists’ celebrate hospital art sale silver jubilee! 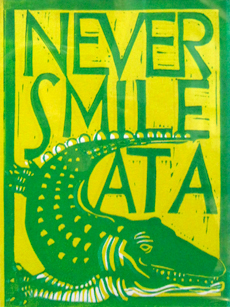 Reading Guild of Artists’ (RGA) is celebrating its 25th annual charity art sale!! 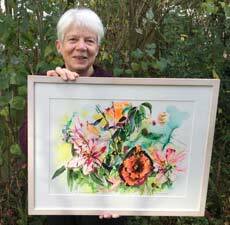 The ever-popular charity arts sale starts Monday 5 November, Royal Berkshire Hospital, Reading. It runs until Saturday 15 December. Entrance is free and 25% of the proceeds go to the Hospital’s ‘RBH Voluntary Services’ charity. Come and join in the fun with Reading Guild of Artists at this year’s ‘Big Draw’, Reading Museum, Monday 22 October 2018, 10.30am to 3.30pm. 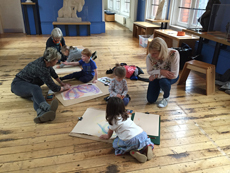 The activity day consists of drop-in sessions, is suitable for all ages. Entrance is free, though donations are welcome. 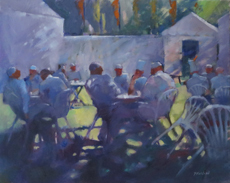 Reading Guild of Artists (RGA) fifth annual Summer Show, which began earlier this month, is still in full swing. It runs until Sunday 24 June, 10am to 4pm daily. Reading Guild of Artists (RGA) will be taking part in the celebrations of the long-awaited opening of the Abbey ruins at ‘Reading Abbey Revealed’ on Saturday 16 June. The event coincides with Water Fest along the River Kennet. 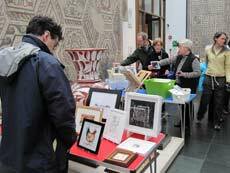 On Saturday 16 June, the RGA will have a one-day pop-up sale between 10.30am and 3.30pm in Reading Museum, where the Reading Abbey Revealed trail starts. The Museum will be open 10am – 4pm. Throughout the day RGA artists will be working ‘en plein air’ around the Museum Quarter. 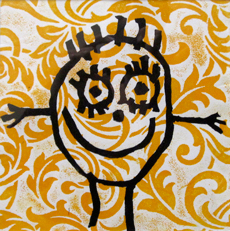 In the Museum there will be an RGA ‘small works sale’ and free workshop opportunities for children. 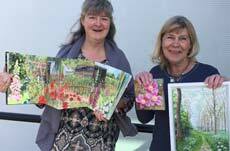 Summer’s here and Reading Guild of Artists is celebrating! 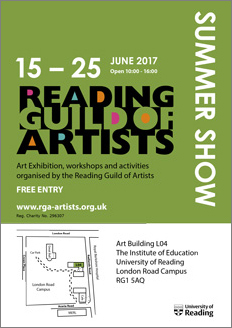 Reading Guild of Artists (RGA) will be hosting a series of workshops at its fifth annual Summer Show. The show starts Thursday 14 June and runs until Sunday 24 June, 10am to 4pm daily. 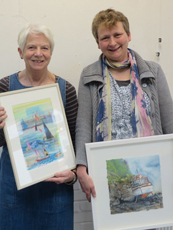 It’s ‘twins’ for Reading Guild of Artists! 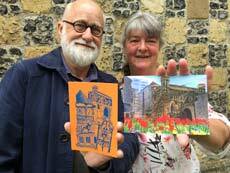 Postcards designed by Reading Guild of Artists’ (RGA)artists Martin Andrews and Thérèse Lawlor have been selected to represent Reading in an international project which celebrates 30 years’ twinning Düsseldorf with Reading. Düsseldorf is celebrating 30 years of town twinning with Reading this year (2018) (together with the towns of Haifa, and Chemnitz) and to commemorate this milestone anniversary, people from all three towns are invited to send a postcard, together with their good wishes or thoughts on sister cities. The project ‘Lilies for Oscar Wilde’, which was a partnership with independent artists and makers, Reading Museum, Reading Guild of Artists (RGA), Jelly, Two Rivers Press, Whiteknights Studio Trail, Cherubs Floral Design, Friends of Reading Museum and Haslams has been shortlisted for two categories in this year’s prestigious Reading Cultural Awards. The two categories are; ‘Made in Reading’ and ‘Celebrating Reading's Heritage’. 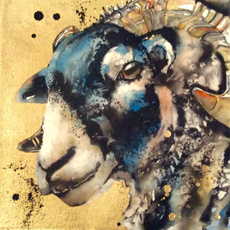 Two for the price of one– Reading Guild of Artists exhibiting twice in one week! 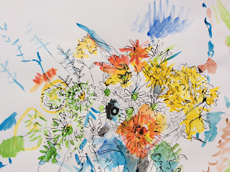 This week sees a potential first for the Reading Guild of Artists (RGA) as two of its members, artists, Carole Pembrooke and Karen Spencer, have work in two exhibitions in Reading in one week! 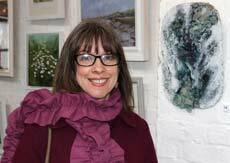 Reading Guild of Artists first to benefit from artists’ gallery. 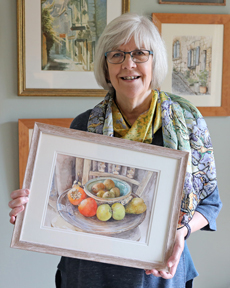 A new artists’ gallery, the HolyBrook Gallery, for Reading art groups and individuals from the surrounding area, is launched on Thursday 12 April and Reading Guild of Artists (RGA) will be the first group to host an exhibition. The new gallery has been funded by RG Spaces. The RGA exhibition features about 20 works of art by RGA members, in a variety of media and showcases the diversity of styles used by its members. "... and the waters flowing beneath ..."
As part of John Lewis’ Easter extravaganza, eight artists from Reading Guild of Artists (RGA) will be displaying their work in the summer house on the Lower Ground Floor of John Lewis, Reading, from Saturday 24 March to Tuesday 27 March, as part of its Easter Extravaganza, between 10am and 4pm each day. 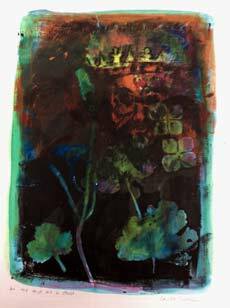 One of our artists, Carole Stephens, is hoping to exhibit her artwork 'At the end all is dust', which depicts an image of Henry I, who died in France and was transported back to Reading Abbey via the Thames and Kennett. She said: "In this mysterious print, Henry I is imagined floating below the surface, his face glowing through the dark, murky river water." Martina Hildebrandt, handing over her ‘lily’ to Brian Johns, who successfully bid for the lily. The culmination of a partnership between Jelly, Reading Guild of Artists (RGA), Reading Museum, Two Rivers Press, Whiteknight’s Trail, and many independent artists and makers, to celebrate Oscar Wilde by creating a huge bouquet of lilies, has raised just over £1,000 for Reading-based homeless charity, Launchpad. 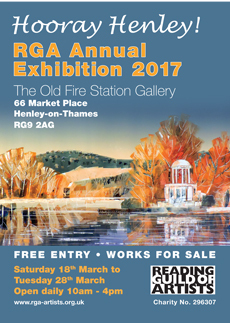 A Pop-Up Exhibition of RGA members' work, with paintings, prints, books, cards and more for sale. 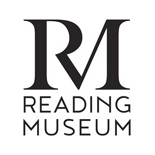 25% of all exhibition sales will be donated to Reading Museum and donations for activities are welcome. Plus lots of activities for all the family during this half-term week, all with a bit of a Medieval theme in support of the Reading Museum as it launches the new Reading Abbey Gallery. There will also be artists at work and demonstrations. Drop in and help create a paper Stained Glass panel, or join in with the Sequel to the Bayeux Tapestry. We'll have 'Colouring-in' for all ages. 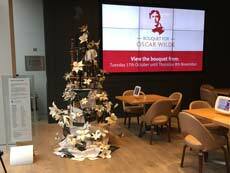 Reading residents and visitors are invited to bid in a blind auction to buy a unique piece of artwork – one of the handmade ‘lilies for Oscar Wilde’, currently on display at Reading Museum. All proceeds will go to homeless charity, Launchpad Reading. 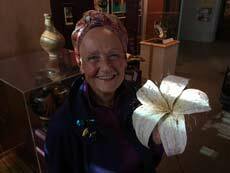 The ‘lilies’ are currently on display at Reading Museum and the blind auction is open now and runs until 12noon, Wednesday 7 February, 2018. Successful bidders will be contacted by 4pm, Thursday 8, 2018. The exhibition is on display along the Link Corridors, Level 2. From the main entrance Craven Road, Reading Berkshire RG1 5AN or use south corridor entrance in Addington Road, near outpatients 1. Our annual corridor art exhibition of paintings, drawings and original prints has lots of lovely present ideas for the Festive Season. 25% of proceeds go to the Hospital Art and Garden Fund. Look out for our poster on Reading buses! and The Critic as Artist exhibition. Reading Museum in collaboration with Jelly, Reading Guild of Artists (RGA), Two Rivers Press, Whiteknight’s Trail, and many independent artists and ‘makers’ celebrate the wit and wisdom of Oscar Wilde by commemorating his birthday on Monday 16 October. 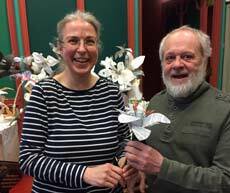 Local Reading artists and ‘makers’ joined forces to create some stunning lilies – using a range of materials, from ceramics to fabric, paper and plastic, found objects and recycled ones, to create a unique ‘bouquet’, designed and staged by award winning florist Marc Allridge. The flowers will be debuting at Haslams, Friar Street, Reading on Monday 16 October. exhibit my own paintings, and it gives us all a chance to see the work of other artists." 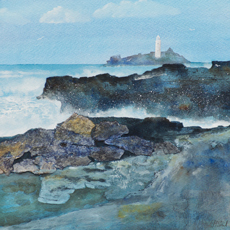 As well as an extensive exhibition, there will be workshops and art activities taking place most days throughout the show, with lots of works, cards and gifts for sale. Also on display will be work by the final year BA Ed Art students. 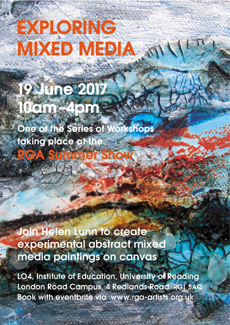 Helen Lunn, from Sulhamstead is leading a workshop at the RGA Summer Show. 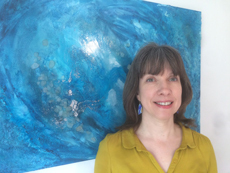 She says: "I am excited to be showing my water themed mixed media paintings in this lovely bright space again. 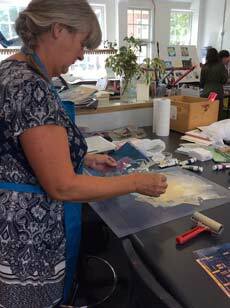 Come along and join me on 19th June, for my workshop, 'Exploring Mixed Media', to create your own abstract mixed media painting. The full workshop series is on the RGA website." Looking for something different to do at the bank holiday weekend? 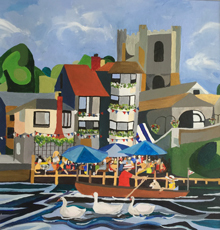 Several members of the Reading Guild of Artists (RGA) are taking part in the Henley Arts Trail from 29 April to 1 May and venue 23 is a new one showing works by local artists Linda Saul and Carole Stephens. 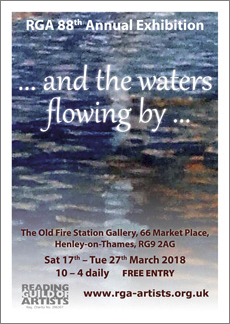 Still time to visit ‘Hooray Henley!’ exhibition and find a truly personal Mothering Sunday present. 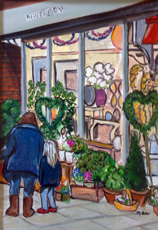 Henley high street florist catches your eye as you drive through the town centre! 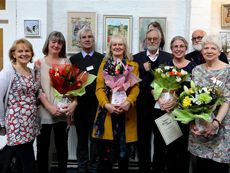 The recent ‘slam’ sale held by the Reading Guild of Artists, a 150-strong body of Reading artists, raised £212.85 from proceeds of sales at the event. Sales totalled £851.40 and 25% of sales (£212.85) will go to the Reading Museum. 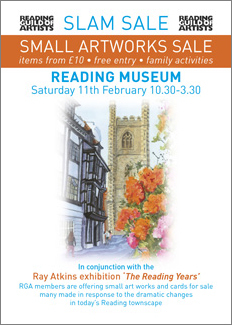 In conjunction with the Reading Museum's Art in the Dark Months season and The Ray Atkins: The Reading Years exhibition. best access from the South Entrance. 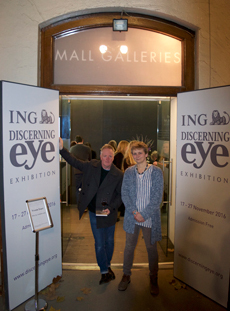 Linda Saul and Mick McNicholas have artwork on display at the 25th Discerning Eye exhibition at the Mall Galleries in London. The exhibition runs 17 - 27 November 2016.